I think the first thing I ever cooked by myself was pasta (spaghetti to be exact). 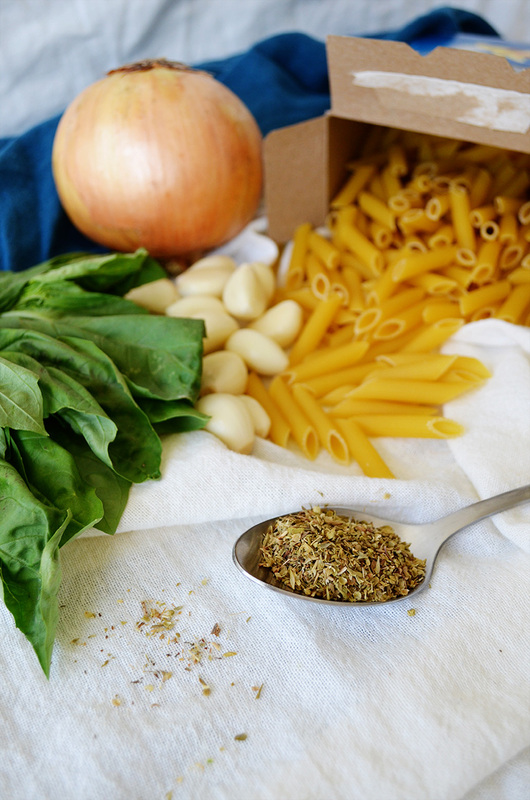 Isn’t pasta everyone’s first homemade meal? You’ll have to let me know if that isn’t true for you! It’s really hard to dislike pasta, especially baked ziti. It is relatively inexpensive, yields a lot, and is a no-brainer. 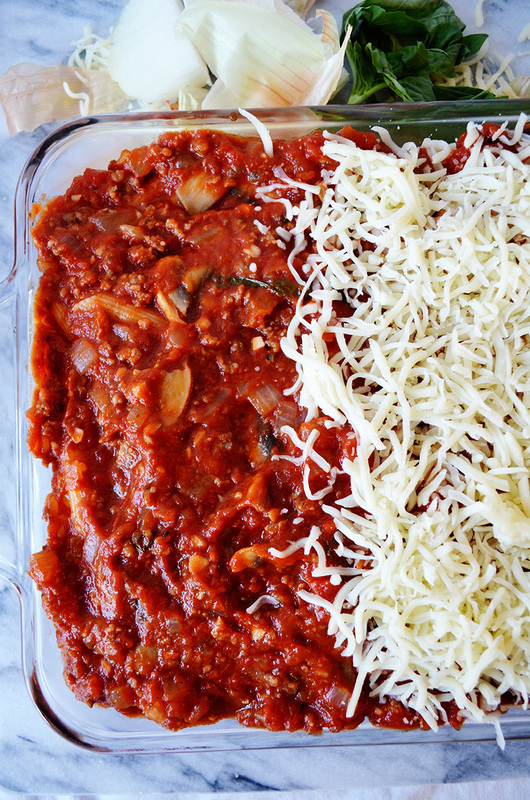 What’s great about this recipe is you get to make your own marinara sauce! Yep, homemade marina catered to your (well in this case, my) liking. Once you start making your own marinara, you can’t go back to store-bought. You just can’t. Your tastebuds won’t let you. This sauce is irresistible, kind of like a handsome man who is 6 feet tall with orange-ish hair and writes with his left hand. I may or may not be talking about Karl. Step 1: add pasta, step 2: add sauce, step 3: add cheese, repeat. Thankfully this only bakes in the oven for 30 minutes. 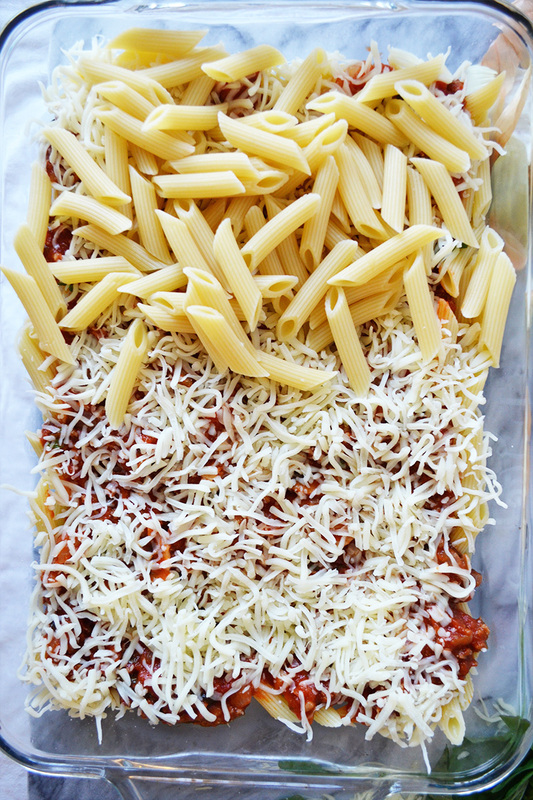 I once tried a baked ziti recipe that requires 1 hour of baking. Who has that kind of patience when mushrooms and italian sausage are involved? Not I! 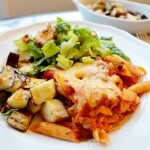 I served the baked ziti with roasted garlic eggplant. My eyes and tastebuds were both watering at the sight of this beauty. 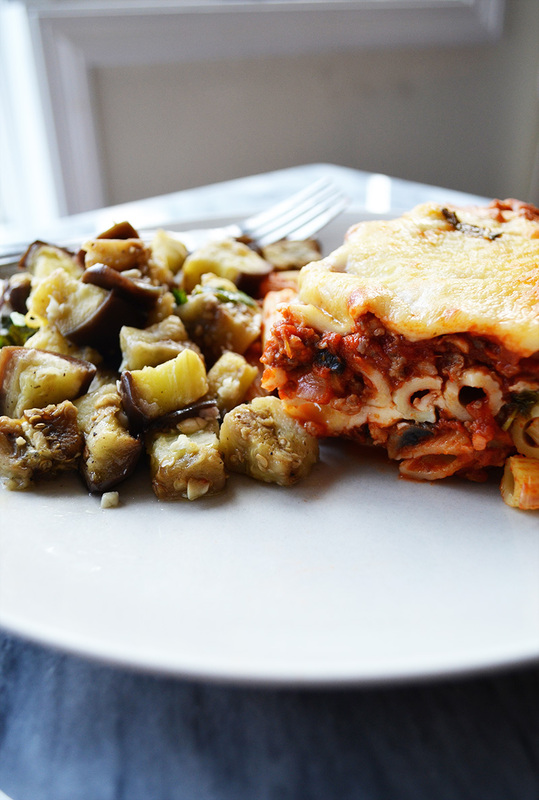 This eggplant side dish roasts in 10-14 minutes, so you can easily whip it up with the baked ziti. They go together so well! It would be a shame not to serve them side by side. In a large saute pan, heat up the olive oil over medium heat. When the oil is hot, brown the sausage for 8 minutes, turning them over once halfway through (it's ok if they're not cooked through because they'll finish cooking in the sauce). Remove from the heat and slice into 1/4 inch thick pieces. Set aside. Add the onions and garlic into the same saute pan, then cook for 4-5 minutes, until the onions are translucent. Add the mushrooms and cook for 3 minutes, until soft. Season with some salt and pepper. Pour in the crushed tomatoes, tomato sauce, and tomato paste. Stir in the sugar, red wine vinegar, dried oregano, fresh basil, red pepper flakes, 1/2 teaspoon salt, and 1/4 teaspoon pepper to taste. Add the sausage into the sauce. Reduce the heat to medium-low and allow it to simmer for 30 minutes. Bring a large pot of water to boil, then season with some salt. Add the pasta and cook uncovered for 10-11 minutes, stirring occasionally. Drain the pasta, rinse with cool water, then set aside. 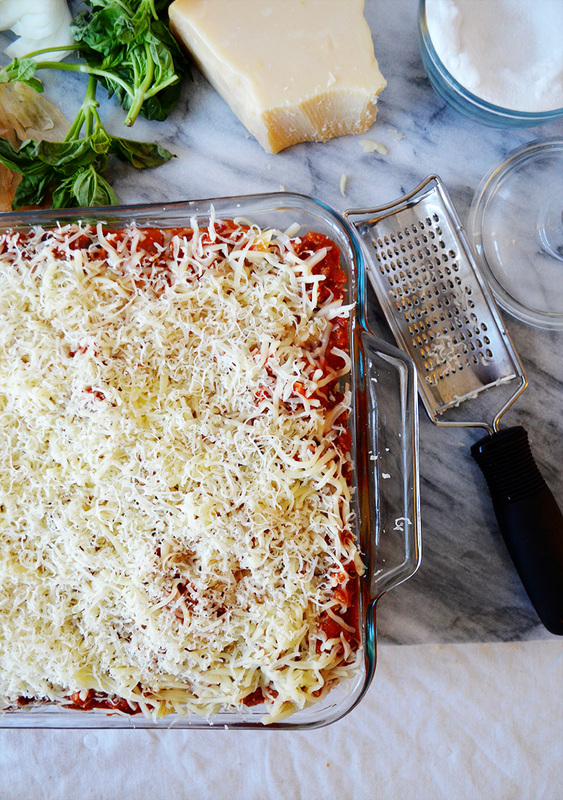 When the sauce is ready, pour half the pasta in a 9''x13'' glass baking dish. Ladle half the sauce over the pasta, then top with half the Mozzarella and Provolone. Pour in the remainder of the pasta, then the sauce. Top with the Parmigiano-Reggiano and the rest of the Mozzarella and Provolone. Bake in the oven for 30 minutes. Allow to cool for 15 minutes, then serve. 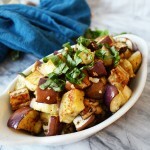 In a large mixing bowl, combine the eggplant, garlic, oil, salt, and pepper. Stir well to combine all the ingredients. 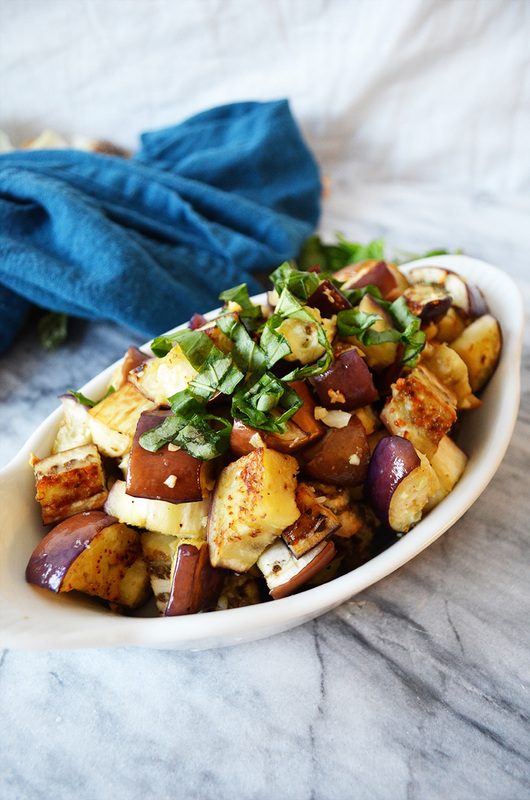 Spread the eggplant evenly on a greased cookie sheet and roast for 10-14 minutes. If all the eggplant does not fit on one cookie sheet, work in batches to avoid overcrowding. This entry was posted in Entrees, Sides and tagged pork, sauce & dressing, vegetarian. This is my kind of pasta dish!! I love such one pot meals! Thanks for stopping by Ami! I hope you enjoy the recipe. It’s delicious!